Do not read this post if you haven’t watch Hunter X Hunter Chimera Ant Arc. Actually, you will need to have watched Hunter x Hunter since the beginning to truly understand this post. Gon transformation in Hunter x Hunter Episode 131 – Anger X And X Light, that made his body mature around 20+ years, and most likely made him the most powerful person in the world, could have been achieved by Gon going through 4 of the five stages of grief multiple times. Let’s analyze each stage explaining why everything builds toward catastrophic anger. Gon completely denies Kite dead and in this case, his usual positive attitude plays a significant role in clouding his reasonable judgment (if he had one, to begin with). After witnessing Pitou attack on Kite and having felt her sinister aura Killua, always calmed and collected, immediately concluded that Kite couldn’t have possibly survived the fight with Pitou. He even said to Netero, Morel, and Knov that he couldn’t see any of them defeating that thing. On the other hand, Gon starts to develop a powerful state of mind, clearly determined in believing Pitou couldn't have possibly defeated kite. This marks the start of Gon denial stage. He even convinced Killua that Kite was still alive and they should hurry back to save him. At that point, Gon assumed Kite was hiding from the Chimera Ants, and he convinced himself that, do to Kite injury, he would not be able to do anything. Gon saw himself as the hero that will rescue Kite from his imprisonment. All he needed to do was get stronger. Gon becomes frustrated to the point of a momentary depression because he couldn’t beat Knuckle and felt overwhelmed with his weakness, which prevented him from saving Kite the second time they went to NGL. Note that in the definition of the depression stage (see references below) the depression comes from the realization of losing someone, but in the case of Gon, he is depressed because he is too weak to do anything to save Kite. 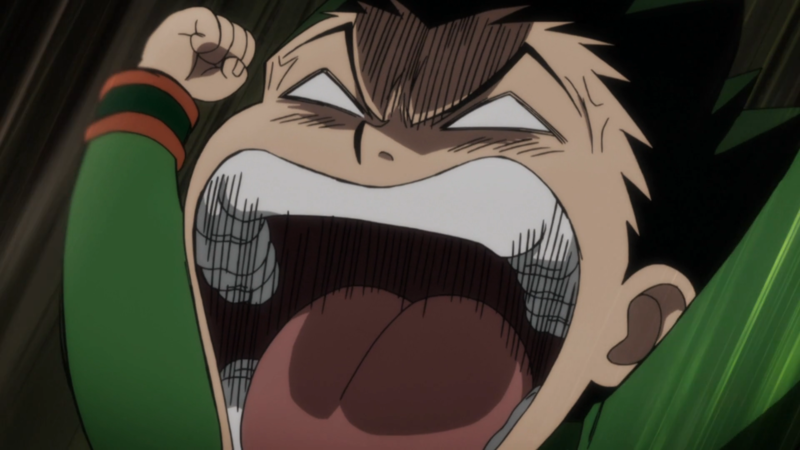 Gon screams with passion to get over his frustration. Gon quickly gets over his depression by merely shifting his belief that Knuckle and the other Hunters will save kite. All he had to do on his end is become stronger not to disappoint Kite when he comes back. After witnessing Kite puppet-like condition Gon holds firm to his denial of Kite being dead, but this time though he shifted his denial from having to rescue Kite to finding a way to get him back to normal. By now Gon had gone through the denial stage twice by just changing the conditions, so he doesn’t have to acknowledge Kite is dead (he is in complete denial). Gon focused all his anger towards Pitou blaming her for getting Kite the way he was (like a marionette). His previous weakness is compensated with hate so deep that grants him catastrophic power. 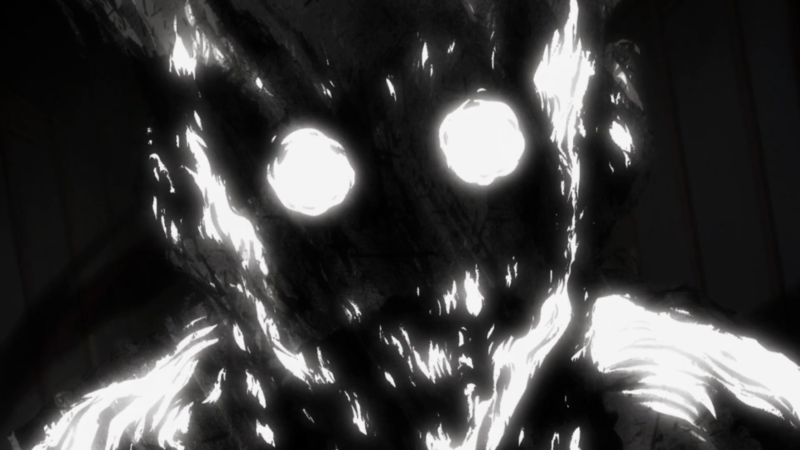 All Gon had to do was focus all his hate toward Pitou to unleash a power entirely fuelled by rage and anger. Even Morel got scared when watching Gon’s attack. No… It isn’t my fault Pitou’s the one who killed him! Not me! Gon goes through the stage of anger once again, but this time, after finally accepting Kite indeed is dead, the amount of anger toward Pitou is so vast that made Gon level up to level a trillion. All the conditions were met to awaken this power, and the amount of hate and anger was so absurd that Gon didn’t care if that was his end. As long as he could completely obliterate Pitou from the face of the Earth, he will come to terms with his suicidal decision. After having massacred Pitou and going through the stages of grief multiple times, Gon was overwhelmed with an extreme sadness of finishing the job the way Kite taught him, but without being able to save him. Even after an undead Pitou cut his right arm, Gon felt somewhat redeemed and could at least die after achieving his mission. Thanks to Killua and Alluka, Gon came back from certain death and was able to reach the final stage, acceptance. Although in this case is completely different because Kite didn’t die, he well….turned into a little girl. What is interesting here is the acceptance applies to both Gon and Kite because neither of them had the training required to defeat Pitou without dying. So after cheating dead, they just needed to accept that they should move on, now as true friends that will help each other in the future. Gon going through all grief stages to reach his transformation was so amazingly built that when it happened in episode 131, it was a masterpiece. It didn’t occur because plot convenience (I’m looking at your Fairy Tail!!! ), it happened because everything builds to that point. What do you think? Leave a comment with your thoughts and theories. Would love to discuss details I didn’t see. Axelrod, J. (2016). The 5 Stages of Grief & Loss. Psych Central. Goldberg, J., MD (Ed.). (2016, May 9). Stages of Grief: How to Cope With Grief and Loss. WebMD. Reddit. (2014, May 22). Gon is going through the five stages of grief • /r/HunterXHunter. Ross, E. K., & Kessler, D. (2013). Five Stages of Grief. Togashi, Y. (2011). Hunter x Hunter [Anime]. Japan: Nippon Television Network. I'm quite happy redditors liked my analysis. This post took me a while to write. Please help!! Need to know what chapter Killua took his sister to the hospital to heal Gon?? Need to get caught up…..
That would be Episode 145 – Defeat x And x Reunion. Fantastic episode BTW! I would like to know the episode from the picture of Gon talking to girl Kite, saying they both need more training. Thank you. Hi Christian. That would be Episode 147 – Salvation x And x Future. I agree with previous comment very well done!